I’m investing in Windows RT, not Windows 8. Here’s why. It can’t have escaped your attention that Windows 8 has finally been released. 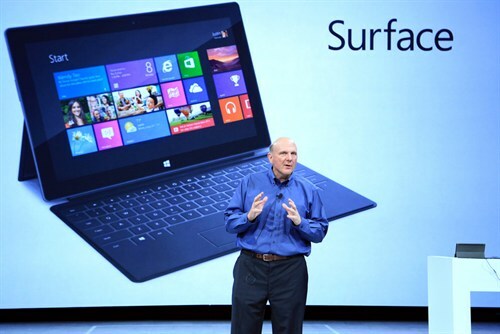 Microsoft previously held 90% of the PC device market, which under Steve Ballmer is quickly collapsing. Microsoft are being slated for their slow response to trends set by other companies and a significant paradigm shift is probably their only way to slow down the user drain. But under Bill Gates, Microsoft was actually first with modern ideas and devices. Embedded computing using an enterprise operating system was ridiculed as “Windows for Toasters”. Look in your set-top box and you might find a version of Windows Compact Edition. The first tablet computer was not released by Apple, it was released by Microsoft. Unwieldy, yes, but they were before Apple. Smartphones, while not innovated by Microsoft, were largely powered by Windows CE on an iPaq or similar. If there has been any innovation that has come from Apple, particularly with regards to their tablet, it is their user interface. This is why Microsoft have fundamentally shifted their user experience in the direction of touch – whether that is appropriate for your immediate device, or not. Windows RT (Windows 8 on ARM chips designed for tablets) is a beautiful OS. It’s smooth, fast enough to be usable and shines on good hardware, and the Surface RT is very good hardware. Battery life easily lasts all day given frequent use, the screen is excellent and the keyboard surprisingly usable. The balance between “modern UI” apps and Office apps is just about right, with most of your time being spent browsing through the apps using the slick and punchy user interface. If you need to work (something that is not quite as possible on the iPad, etc. ), the device acts as what netBooks should always have been: quick, simple, small. If there’s one thing I have to gripe about, it’s the touchscreen keyboard. For some reason, it looks like Windows Phone 7/8, but works completely differently. Now I’ve got used to the really smart and slick keyboard on the phone, I now have re-learn another set of techniques on Windows 8. There is no reason for this other than sheer incompetence or ignorance internal to Microsoft. The irony is that it’s probably because the Windows developers are still using iPhones so haven’t seen the alternative that would have created a consistent experience. Windows RT is where Windows 8 works best. Windows 8 (sitting on the beige box under the desk in your office) is also a nice OS. It’s faster, smaller and looks very swish. But that’s where it ends. If you aren’t using it on a touch device, it’s challenging to use. If you think the Office Ribbon furore was loud, wait till you hear the pushback for Windows 8. With no Start menu, hidden “hot” corners that are difficult to find and even more difficult to use in a terminal or multiple-monitor scenario, frustration is high. Except you probably won’t hear any pushback, you’ll just see enterprises continuing to use the excellent Windows 7 operating system until the very end of the support contract Microsoft provide, which will give them sufficient time to investigate, test and implement the successor to Windows 8. And it won’t be Windows 9. With a Windows version averaging every 3 years or so, the technology world could have changed unrecognisably (look how far Touch has come, from an unexpected genesis). Perhaps it will be Google Apps, or some other thin-terminal cloud based platform. Perhaps it will be a Minority Report gesture sensitive 3D holo-space high resolution immersive user experience. We expect Apple to be arrogant; “you’re holding it wrong”, or “you’re doing it wrong”. But Apple is Apple, they have a following and that following is sufficiently loyal to absorb idiosyncracies in design and software. Microsoft is an enterprise-class operating system vendor, and I fear they’ve just angered their biggest customer. The customer who needs to get the job done using existing skills and kit. ← Encouragement without the condescension?